, while people look for [ideas] and then [stores] to help them carry out their vision. We’re taking our annual peek at what Halloween fun has people going to Google for inspiration. Jersey Shore fans seem interested in how to get Snooki’s hair just right—[snooki wig] and [snooki costume wig] are popular related searches. 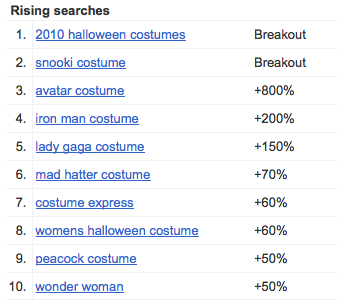 People from Pennsylvania were most likely to search for [snooki costume] in October, followed—fittingly—by folks from New Jersey. Not to be left out, however, Snooki’s costars Pauly D and The Situation are also showing up as popular Halloween ideas in the past few months. [neytiri] tops the list of related searches for [avatar costume], as people try to figure out the complexities of becoming a blue resident of another planet. Gaga folks are trying to mimic an equally tough outfit: the singer’s famous meat dress. Searches for “meat costume” have grown more than 5,000% since July. We’ve also seen rising searches for [glee cheerios costume], [justin bieber costume], [katy perry costume], [kenny powers costume] and more. Turning from the U.S. to other countries, we see similar costume searches, minus our favorite reality TV stars: in Canada, Australia, Ireland and the U.K., Avatar and Lady Gaga come out on top. “Alice in Wonderland” characters are popular everywhere, but only in Australia are people looking to turn themselves into the [queen of hearts]. And the U.K. distinguishes itself with searches for good old-fashioned Halloween standbys [skeleton] and [zombie]. Brits are also looking to transform themselves into [mario] and [buzz lightyear]. 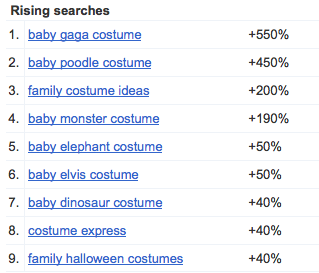 We also saw searches for [baby lobster costume], [baby yoda costume], [baby ladybug]. [baby bat] and [baby lion]. (And [baby spice], but that’s neither here nor there.) Costumes for kids aren’t too far off from adult costumes, with Avatar and Gaga atop the heap, however, you might see a lot of [werewolf kids] trick-or-treating this weekend, and the occasional [strawberry shortcake]. Last but not least, we can’t leave our canine friends out of the fun. This year, it seems people are taking inspiration from the movies to turn their pups into [slinky dog]s—the term has gone up 350%. People also seem to like to make their dogs another beast for the day, whether a [pig dog] or a [shark dog], or into a food item in a [taco dog costume] or the classic [hot dog costume]. Finally, you might see some dogs matching babies in your neighborhood, as we’ve seen growing interest in [lobster dog costume] and [yoda dog costume], although the latter is not rising as fast as [ewok dog costume]. One thing’s for sure—with all these ideas, there’s no excuse not to dress up! So whether you’re going as Gaga or Yoda this weekend—or something we couldn’t even dream of—we hope you have a happy Halloween. Every October, it seems like every third question you hear is “What are you going to dress up as for Halloween?” We see this question reflected annually in Google searches, as millions of people turn to the Internet to help them prepare for this creepy-crawliest of holidays. Searches for “costume” have steadily risen since early August, while people look for [ideas] and then [stores] to help them carry out their vision. We’re taking our annual peek at what Halloween fun has people going to Google for inspiration.